Fresh vegetables from the garden is one of the best parts of Summer for us. Robert's mom sent us home with a bag full of bok choy and swiss chard from her garden this weekend that is now overflowing in our refrigerator As much as I love our quirky treehouse of an apartment I'm getting anxious for outdoor space to start our own garden. 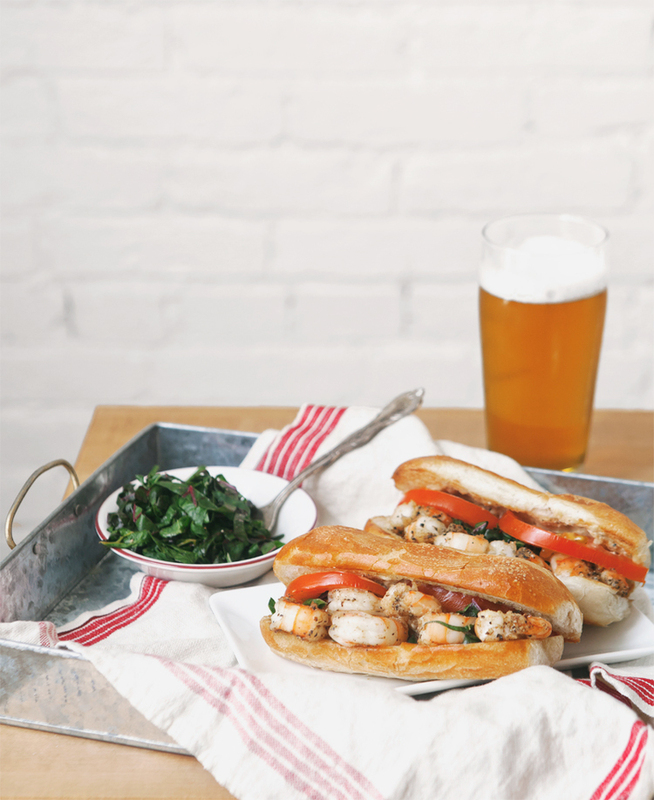 Po Boys came to mind as we were throwing around dinner ideas on Sunday, mostly because we wanted to make a slaw with the swiss chard. 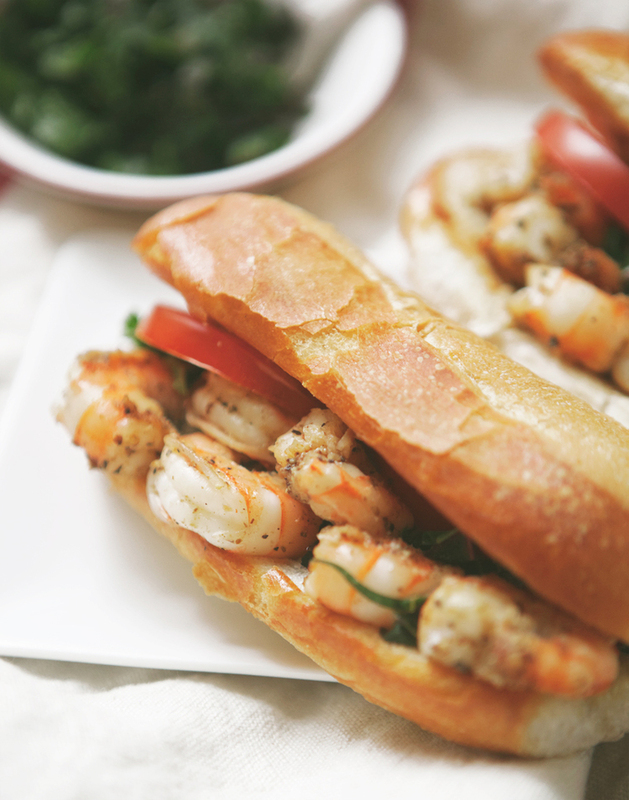 Robert envisioned the perfect shrimp sandwich from start to finish, resulting in this recipe. 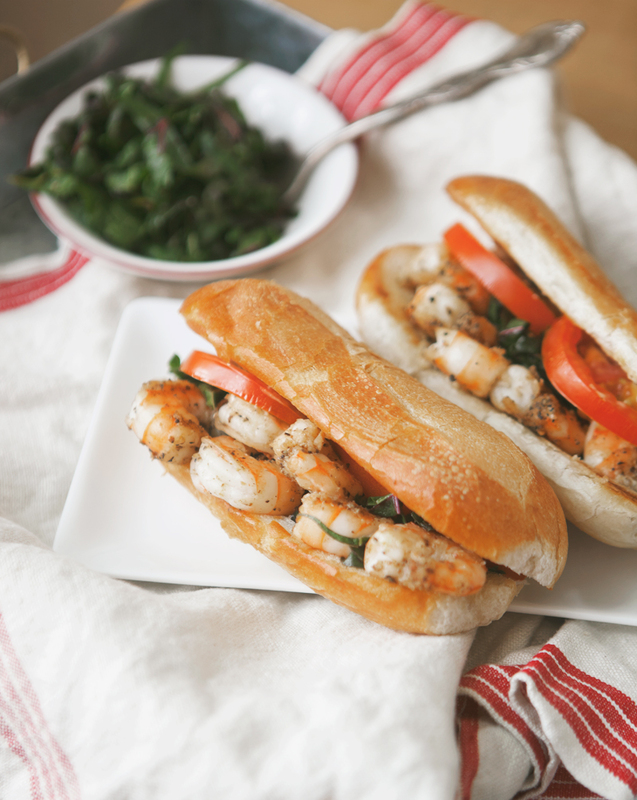 He opted to sauté the shrimp instead of frying, and the swiss chard adds a really nice flavor that makes the whole thing taste about as fresh and light as this kind of sandwich can get. In a bowl, whisk to combine mayonaise, mustard, horseradish, pickle juice, white pepper, 2 tsp old bay and black pepper to taste. Cover and refrigerate until ready to serve. Rinse and dry swiss chard. Remove stems and center stalks. Stack chard leaves and roll into a cigar shape. Slice thinly crosswise to create ribbons. In a bowl, mix chard, 1tbs canola oil, juice of 1 lemon, 1 tsp old bay seasoning. Toss to combine and set aside. Toss shrimp with salt, pepper, and additional old bay seasoning to coat. Heat skillet over medium high heat, add 1 tbs canola oil. Sauté shrimp 3 minutes each side, or until they turn opaque and pink. Remove from heat and set aside. Split rolls lengthwise and lightly toast in skillet. Divide remoulade between two sandwiches, coating both sides of toasted roll. Top with shrimp, chard slaw, and sliced tomato.